The Warband seemed content to keep eachother’s company, choosing to open another contract with Sir Gylliam, allowing them to vanquishing undead of behalf of the Lord.Adrysse went to the Vivaldi Temple, and consulted Priest Embryn Kaibus regarding Necrology. Priest Kaibus, informed Adrysse that such knowledge was only accessible through proscription of a Chaplain, or higher ranking member of the faith. Adrysse explained she now possessed the Ardent Crest, which suggested Chaplain Taillefer has passed or was in grave danger. The Priest Kaibus concluded by charging Adrysse with delivering the Relic back to Le’Ghentel, where she could leave it in safe hands or find the knowledge she needed to wield it. As an afterthought, the Priest also informed Adrysse of a texts that would allow her to exorcise the corruption from tainted denizens, vanquishing them in the process. Thorgrim. Adrysse and Merick travelled east via the trade roads stopping at open homes and haberdasheries. Merick now part of the Van'tese guard, performed his duties in service to his lord by recruiting a young man into the militia. The warband also stopped at the East Tower, on their journey, which had been attacked by Ogroids. Here, Merick further tended his duty to the Van’tese Guard securing the tower and ensuring it was remanned before the band moved on. On the final leg of their journey, the warband crossed paths with an Elven wilder, who was traveling to Van’tese in hopes of finding work during the frosts. The warband explained they had such work available and Thorgrim explained the mercenary contracts. Thorgrim tendered a position with the Warband which the Wilder, Torvus Antair agreed to. With the Wilder, the company completed their journey to Le’Ghentel, the Shrine Monastery. They ventured into the stone monolith in hopes of being permitted to, or liberating the described holy texts they required. The Monastery’s courts and halls were littered with signs of violence and destruction. It was quickly apparent that the site had been corrupted and those who once tended its halls were missing or likely dead. 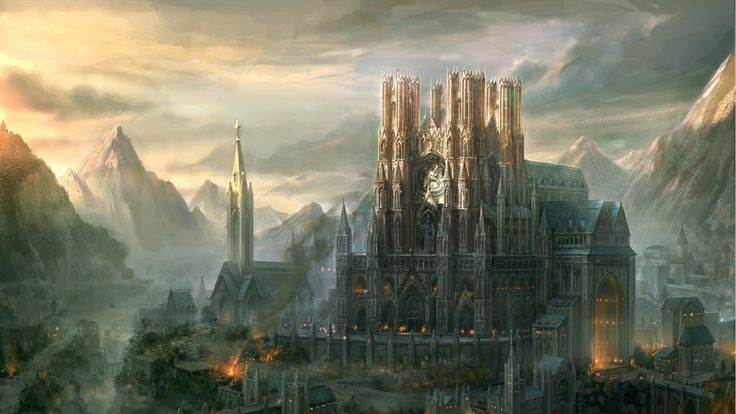 The warband explored the grand sacred halls eventually coming to the central auditorium, where Le’Ghentel’s sacred vault was rumoured to be located. Here they discovered the remnants of the force believed to have desecrated this Shrine Monastary: a large Ogroid raiding party of goblins, led by a Witch Marked Champion. With the help of their newly hired ally Torvus, the warband were able to kill the Ogroids and behead the challenging Champion. However, in the wake of the battle: Thorgrim, Adrysse and Merick felt the same Abysal presence surge through the halls. Living shadows clawed their way into the fallen corpse of the Witch Marked Orc Champion. The Abyssal roared, cursing the warband declaring that he would butcher them for their interference. He spat venomous words of malevolent pity, explaining that they would not be blessed with the opportunity to see the Ghenraen Kingdom raised to bedrock, deprived of the chance to witness the return of the Cesdradin Empire. At this moment, Wylliam and Dorn arrived, working to support of the warbands efforts to thwart the Abyssal, and banish him from the Material Plane. The warband combined their efforts and soon the Champion’s body once more fell lifeless to the floor. The group then travelled back to, and between Van'tese and Rochford, giving their reports. The told explained that the grave fields of Le’Ghentel had been fouled, and that some ten thousand corpses had been raised. The warband and addition to Wylliam and Dorn, believed the Necrophages and the Ogroids were using the underlands to move across the kingdom, unchallenged. The mercenary group then replenished their spent resources and discussed their next course of action. Knowing the Priests of Le’Ghentel were missing or dead, just like Chaplain Taillefer. For Adrysse, who now also possessed the Mortem Maleficarum and the Scroll of Consecration, this meant she was responsible for the protection and deliverance of some of her faith’s most revered Relics.